The Cat In Sheep's Clothing Or A Sheepcat. The first Selkirk Rex was spotted in 1987 as a curly-coated, dilute calico female kitten in an otherwise normal straight haired litter of non-pedigree cats. This litter along with their straight haired mother had been deposited in an animal shelter as unwanted pets. And so began the history of the Selkirk Rex, developed from a natural mutation that arose in the United States. The beautiful cat in the picture is Ch. Dreamhunters Aldebaran, Selkirk Rex , male, blue-tabby-point. Owned by Selkirk Breeders "Monika and her little Tigers" in Germany - Website: Dreamhunters the site is in English and German. The curly kitten was noticed as something out of the ordinary by Peggy Voorhees of the Bozeman Humane Society in Wyoming (USA). Because the coat of the kitten was so unusual, the female kitten was adopted by Jeri Newman, a Montana breeder of pedigree Persian Cats. When 14 months old, this young female, now known as "Miss De Presto", was mated with Newman's champion black Persian called "Photo Finish of Deekay", and on 4th July 1998 produced a litter of six kittens. Half of these displayed their mother's curly coat. One was a black and white male, another was a black female and a third was a tortie female. It was soon clear that this was a new breed and the name of Selkirk was chosen for the breed, after the Selkirk Mountains in Wyoming. Further matings, including back-crosses to Miss De Presto were organized. There were also out-crosses to various short-haired breeds as well as long-hairs. Other Rex Breeds are not however, to be introduced into the Selkirk development programme, because it is clear that the Selkirk is the only type of Rex that is genetically dominant. This means that the Selkirk cannot be related to any of the other Rex genes, and there is therefore no point in mixing them. Encouraged by the success of the Selkirk programme, the breeders involved formed a Selkirk Rex Society and in August 1990 two American Cat Associations agreed to give official recognition to this new breed. there is now also a Rex Breed Association in Canada. 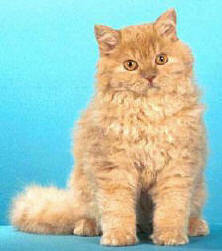 The Selkirk Rex are currently bred into the British Short Hair, Exotic and Persian. With low maintenance and the ability to get along with everyone, they are sure to make the best pet you've ever had. The Selkirk Rex, the third Rex cat to appear on the North American show bench, is markedly different from the two Rex breeds that preceded it - the Cornish Rex and the Devon Rex. Both the Cornish and the Devon are fine boned and svelte-bodied. The Selkirk, however, is a medium to large cat with heavy bone that gives it surprising weight. With coats curly from birth, these rare cats are known as "Cats in Sheep Clothing". Their coats are soft, thick and plush with non-matting loose curls. Unlike other Rex breeds, the Selkirk comes in longhaired and shorthaired varieties. The differences in coat length are most apparent on the tail and ruff. The shorthair's coat texture is soft, plushy, full and obviously curly. The coat stands out from the body and should not appear flat or close-lying. The curls are arranged in "clumps" rather than all over waves. The Selkirk is found in virtually every colour imaginable, including solid, shaded, smoke, tabby, bicolor, pointed, and mink. Although kittens appear very curly at birth, they may lose their curl almost completely, and young cat will go through an untidy-looking stage before they become curly again. the degree of curl on the body varies with climate, season and hormonal factors. Selkirk Rex are very patient, tolerant, very laid back cats, cuddly and playful.